Comedy lost a hero this week. It is with a heavy heart that we say our goodbyes to Rik Mayall – the People’s Poet, the Young One, an imaginary friend; one of the most lovable comedy geniuses of the last thirty years. 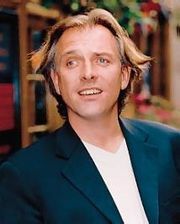 Rik is someone who I had been aware of for over half of my life – The Young Ones being shown to me by one of my school friends, aged only eleven. I found him funny then, but after studying the comedy module in my final term as an undergraduate student, I feel a huge amount of respect for him, and am deeply saddened by his sudden loss. In 2011, Rik Mayall came to Brunel University to film his interactive web drama ‘Soapopolis’, with the help of Creative Writing Subject Leader Max Kinnings and ex Pro Vice Chancellor Steve Dixon. He has been described as ‘a friend of Brunel’, and ‘an amazing person to work with’ by staff and students alike. Rik Mayall will continue to be an icon in the world of comedy for decades to come. Those who write stand up comedy or sit-coms will still look to him for guidance and the confidence to really push the boundaries of what an audience expects. Rik’s song ‘Nobel England’ is currently the number 1 downloaded song, head over to iTunes/Amazon to keep it there. This entry was posted in Uncategorized and tagged Brunel, Comedy, Loss, Rik Mayall, Tribute by brunelwriter. Bookmark the permalink. Rik will be laid to rest tomorrow at a private funeral, with a public memorial planned for September.